Note from Sandi: Here's the third in our series of "heirloom" staff projects from the Summer 2009 issue of Interweave Knits. This time, Eunny Jang, editor of Knits, gives us a lovely yet quick knitted lace pattern–just in time for a last-minute Mother's Day gift! "Heirloom" can mean a lot of things; I tend to think a lot about the old-fashioned urge to make the simple functional items of our daily lives beautiful and worth looking at as well as useful. I love fresh-smelling linens but hate heavy or chemical-based scents and sprays. So simple sachets do the trick nicely. This little lace version is so quick to make that I've got one now in every drawer: I lke filling mine with lavender and dried bergamot rind. Sawdust or shavings from wood (cedar is nice!). Sandi Wiseheart is the founding editor of Knitting Daily. She is now the author of the popular Knitting Daily blog: What's on Sandi's Needles. Are you addicted to lace knitting? 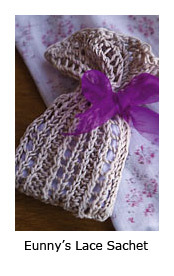 Or maybe you've admired some of the gorgeous knitted lace patterns out there and want to give lace knitting a try? 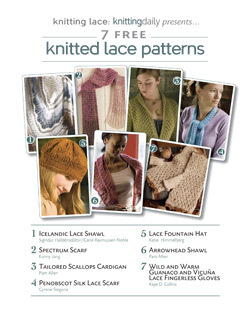 Here are seven of Interweave's top knitted lace patterns, gathered together in one FREE ebook for you.